Did you know that anything that takes time, resources, space, anything that adds cost without adding real value to your product or services is waste? To improve your bottom line, your sales, productivity, and or quality, you must identify and eliminate waste in your processes. So, where do you start? You start by not saying. You want to remove defects because they have a direct impact on your productivity and income. Any work that contains an error, rework mistakes, or lack of something necessary is a defect. It could be a data entry error, pricing error, missing information, missed specification, lost records. The number cause of defects is human error. Remove yourself from the equation and you will see how your productivity improves and the number of mistakes decreases drastically. You can automate your social media marketing efforts using IFTTT and Zapier and you can automate your billing by using software like Freshbooks or WHMCS. To produce an item before is required is overproducing. Generating more that needed right now. For example, more information that the customer needs, more information that the next process needs like creating reports, articles, videos that no one read, making extra copies. Whenever the process is not moving, or when people or equipment are not ready, idle time is created, and waste occurs. For example, waiting for something, faxes, the system to come back up, copy machine, customer response, a file to get back. Many businesses use expensive and complicated equipment when simple tools and methods are available. This creates no value from the customer viewpoint. For example, creating reports, repetitive manual entry of data, use of the standard forms, using the appropriate software. Moving between processes is a cost that adds no value to the product or service. Movement of information does not add value. For example, retrieving and sorting files, carrying documents to and from shared equipment, taking data to another person, going to get signatures. Human brainpower squandered in a process that does not require intelligent thought. Expediting, chasing paper, etcetera, any failure to fulfill, utilize their time, and times of people also injuries, any failure to meet the time and talent of people. For example, overlooking expertise within the organization, not soliciting ideas, or not identify requirements that result in rework, lack of coordination, and communication. Failure to fully use the time talents of people. This ways is related to ergonomics and seen in all instances of movement, stretching, walking, lifting, and reaching, moving of people that does not add value. For example, searching for files, extra moves or keystrokes, clearing away files on the desk, gathering information, looking through manuals and catalogs, handling the paperwork. Movement of people that does not add value. The stockpile of both in process and finished goods inventory are the direct result of overproduction and waiting, more information project material no hand than needed right now. For example files waiting to be work on, open projects, office supplies, emails waiting to read, unused records in the database. What you want to do is analyze the data first. 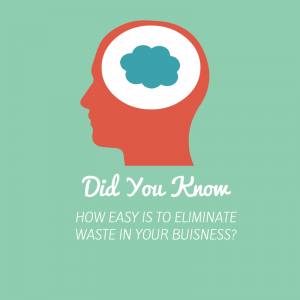 Next you wish to determine if waste is present in your business. One way to help you identify waste in any process is to complete a value stream map. If you want help eliminating one of these eight types of waste in your process fill the form below. Every business creates waste at one point or another. The key here is to eliminate it.